For years market analysts talked about the Greenspan Put. Now we have the Powell Put. Fed Chairman Jerome Powell lifted the markets on Friday by changing his tune once again. He flipped from hawkish to dovish after hearing the message of the market throughout the month of December. Powell cancelled the autopilot message on the roll off of the QE portfolio, called quantitative tightening or QT, and said the ongoing reductions in the portfolio could be adjusted accordingly if the situation warranted. On the Fed current rate hike program, he said at this point the Fed would be patient and flexible towards future rate hikes. This coming only hours after a blowout payroll report with 312,000 jobs added in December, caught the market off guard and bullish investors celebrated while the bears were chased back into the forest. Powell learned the lesson every new Fed chairman must learn. What sounds good on paper before a policy speech may create a negative reaction once those words are spoken in the speech. Fed economists live in a technical bubble, all 800 of them. When positions must be communicated to the investing public, Fed chairmen sometimes forget who they are speaking to and what made sense in the conference room meant something different to investors. In its simplest form this is called foot and mouth disease and all Fed heads must suffer from its effects until they learn how to talk to the investing public. Fortunately, we should be insulated from any future disasters because we have his comments to fall back on and he has learned a valuable lesson that he is not likely to repeat. We can expect future revelations from on high to be more carefully phrased in order to maintain market stability. The S&P futures opened on Sunday evening at +18 but have faded to +10 as I type this. After a big 747-point gain on Friday, I would expect some early week volatility but the longer term path should be higher. Tax loss selling is over. Portfolio managers are sitting on piles of cash and stock buybacks are going into hyperdrive with new announcements this earnings cycle. With stocks so cheap, companies will be getting more bang for their buck. With Apple not dragging the indexes down, we had a good rally on Friday. Powell's dovish comments along with the blowout jobs report were what investors needed to hear. The rally came in three stages. The overnight futures were positive and then the payroll numbers added to those gains. 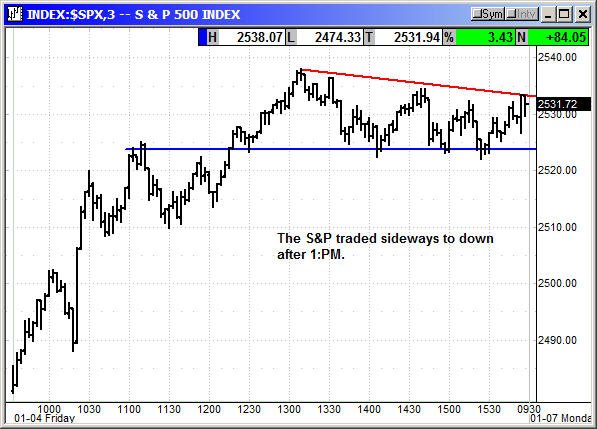 The S&P gapped open and then traded sideways around 2,520 for a couple hours. When Powell spoke the next leg higher began but stalled at 1:PM. The S&P traded sideways at 2,530 the rest of the day. The lack of a closing selloff was positive given the potential for weekend event risk. With the Dow up over 600 points there was a definite reluctance to continue buying in the afternoon. Boeing was the big Dow leader and added as many Dow points on Friday as Apple removed on Thursday. The news of the resumption of Chinese trade talks on Monday this coming week, was a strong motive power. Rising oil prices and a strong rebound in big cap tech stocks also lifted the index. 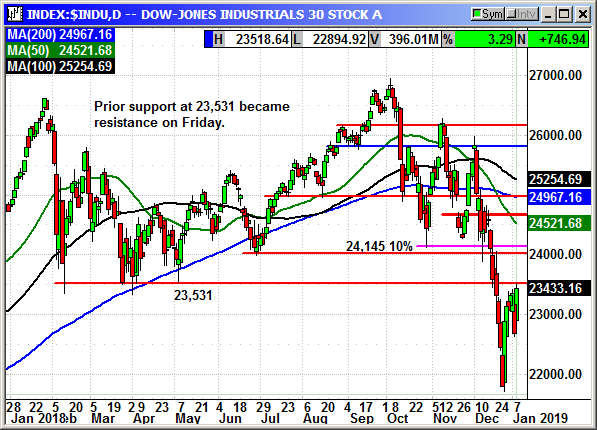 Prior support at 23,531 became resistance and that is the next level to conquer. 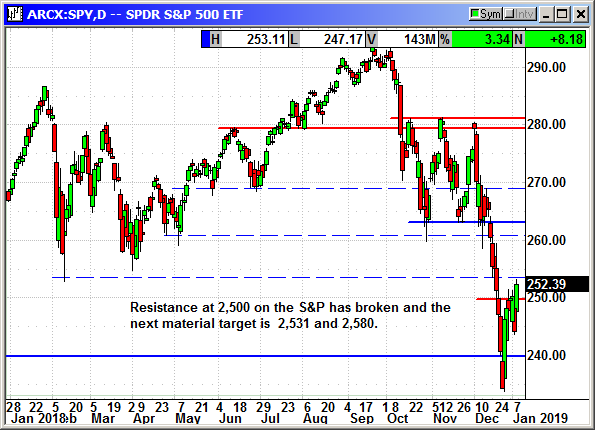 The 24,000/24,145 level should also be a hurdle. The big cap tech stocks were on fire on Friday after being decimated by the Apple warning on Thursday. All sectors, all varieties were seeing hand over fist buying. Alibaba was crushed on Thursday by Apple's comments of a consumer slowdown in China. After numerous companies said they were not seeing the same slowdown, Alibaba exploded higher with a $9 gain. FANG stocks were soaring with Facebook the laggard with "only" a $6 gain. Any big cap tech stock was a winner on Friday. 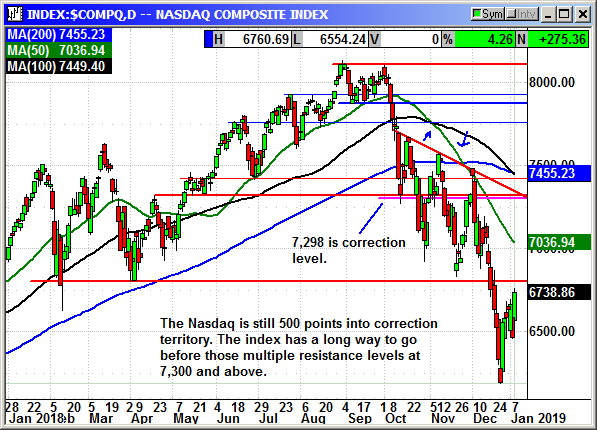 The Nasdaq Composite is still 560 points below the 10% correction level and major resistance at 7,300 and above. 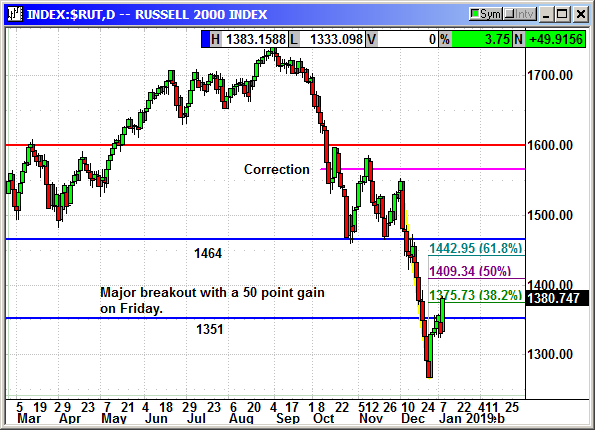 The Russell posted a major win with a 50-point gain and closed over the first Fib resistance level. The next hurdle is 1,409. Small cap investors should be celebrating with the relaxation of the Fed rate hike program. Higher interest rates have been a drag on the small caps since the "long way to neutral" comment on October 3rd and the top in the broader market. Tech stocks rebounded the most on Friday and I would bet CES 2019 had something to do with it. CES 2019 is the largest electronics show in the world and it starts next week. Nvidia will kick it off with a giant two-hour press conference on Sunday evening. It will be live streamed HERE This is always an interesting presentation and the equivalent of looking 10-years into the future of technology. IBM has the keynote speech on Tuesday at 10:30 and they will update on the Red Hat purchase and the future for their improved cloud. The AMD CEO will also present a keynote speech at 11:00 on Wednesday. Dr Lisa Su has completely restructured AMD and they are well ahead of Intel on their technology. This could be a market moving speech for AMD. 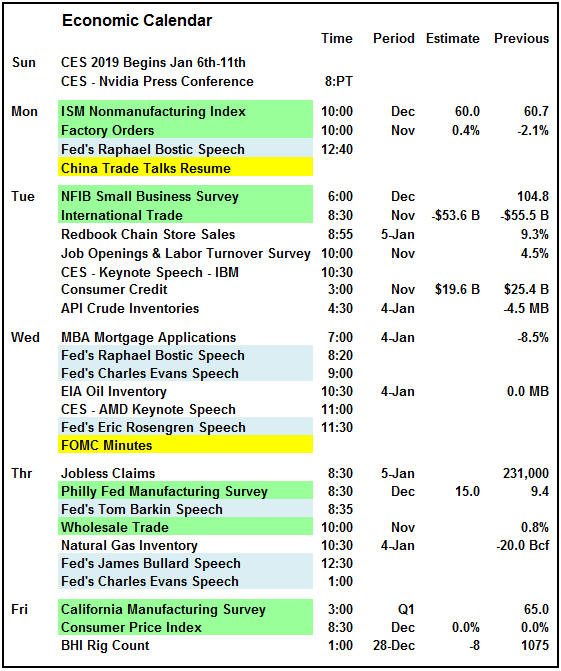 The Philly Fed Manufacturing Survey on Thursday is the most important economic report for the week. This is especially true given the decline in the Manufacturing ISM to two-year lows last week. The FOMC minutes of the last meeting will be on Wednesday and it will be interesting to see if the minutes reflect the new dovish comments from Powell on Friday or did he go through a sudden conversion over the last couple of weeks of market declines. Having everyone in the US mad at you could be a heavy load to carry. His baptism by fire with the market crash on his watch could have led him to a conversion experience. The consumer price index on Friday has a lot less importance since Powell's comments on Friday. Otherwise investors would have been in panic mode for every tenth of a percent increase. 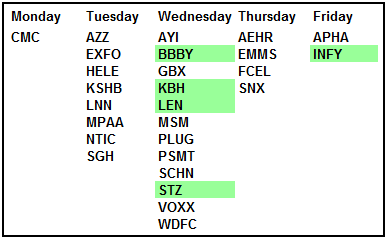 There are very few earnings next week, but the dam is about to burst. The following week more than 250 companies will report. For Q4, 17 S&P companies have reported. Earnings growth has averaged 15.5% with revenue growth up 6.2%. These are mostly smaller companies and the numbers should rise sharply over the next two weeks. Earnings growth estimates normally rise about 4% to 6% from the start of the cycle as positive earnings surprises appear. There have been 42 announcements of positive guidance and 71 guidance warnings for Q4. While I expect the market to move higher, I am not expecting many days like Friday and there will be some profit taking along the way. I would recommend hesitation on adding new plays on Monday. Whenever there is a monster spike in short covering, there is normally a pause where shorts try to reload and those already long decide to take the easy gains. This is an extremely short-term market where holding periods are a week or maybe two weeks if you are lucky. We should see a more positive bias but don't let your excitement overload your common sense. Enter passively and exit aggressively! Feb $52.50 protective put added on Monday. Check the portfolio graphic for any new stop losses in bright yellow. We need to always be prepared for an unexpected decline. Any lines in gray were previously closed. Constellation Brands, Inc., together with its subsidiaries, produces, imports, and markets beer, wine, and spirits in the United States, Canada, Mexico, New Zealand, and Italy. The company sells wine across various categories, including table wine, sparkling wine, and dessert wine. It provides beer primarily under the Corona Extra, Corona Light, Modelo Especial, Modelo Negra, Modelo Chelada, Pacifico, and Victoria brands, as well as Funky Buddha, Obregon Brewery, and Ballast Point brands. The company offers wine under the 7 Moons, Black Box, Clos du Bois, Estancia, Mount Veeder, The Dreaming Tree, Franciscan Estate, Nobilo, The Prisoner, Kim Crawford, Ravage, The Velvet Devil, Kung Fu Girl, Mark West, Meiomi, Robert Mondavi, Ruffino, and Simi brands, as well as Schrader Cellars and Charles Smith brands; and spirits under the Casa Noble, High West, SVEDKA Vodka, Black Velvet Canadian Whisky, Casa Noble Tequila, and High West Whiskey brands. It provides its products to wholesale distributors, retailers, on-premise locations, and state alcohol beverage control agencies. The company was founded in 1945 and is headquartered in Victor, New York. Company description from FinViz.com. Constellation took a $4.1 billion stake in marijuana company Canopy Growth. Their plan is to market THC infused drinks, snacks, etc, wherever marijuana is legal. That includes all of Canada, multiple US states and more than likely the entire US by the end of this decade. There are multiple countries other than Canada where the plant is legal. This has significant implications where medical marijuana is legal. Patients who would rather not smoke a joint can drink a beer or other THC infused beverage with the same results. Constellation took a major hit on the announcement because many funds cannot invest in "sin" stocks. 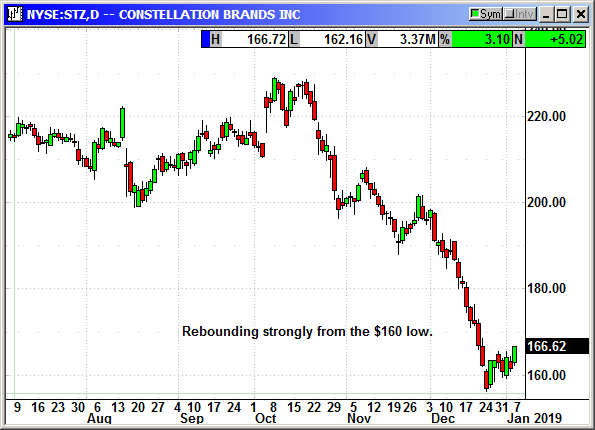 Shares fell to a low of $160 in late December with the market crash but are starting to rebound now. Constellation is a buy just on its regular beverages at this level and the THC drinks are going to add to that valuation in the next couple years. Earnings are January 9th, so we could get a quick pop on this position. I would wait to sell the put until after the earnings just in case they disappoint. Buy Jan 2020 $180 call, currently $13.40, initial stop loss $155.50. Sell short Jan 2020 $140 Put, currently $7.30, initial stop loss $155.50. Apple's guidance warning was a bad hiccup in an otherwise positive week. Thursday was the only speedbump for the week and we appear to be poised for further gains, headlines permitting. With Chinese trade talks resuming on Monday, there is the possibility of good news although I would not expect a real deal until the last minute of February. In theory, investing in LEAPS is a long-term proposition where we hold over earnings in anticipation of a long-term gain. LEAPS should be exited in the normal November rally. No specific news. Shares still holding in the $89 range. The first quarter of the year is normally strong for drug stocks with multiple major drug conferences. Original Trade Description: February 11th. AbbVie was a spinoff from Abbott Laboratories in 2012 and they are doing great. The company reported Q4 adjusted earnings of $1.48 compared to estimates for $1.44. Revenue of $7.74 billion beat estimates for $7.57 billion. They guided for full year earnings in the range of $7.33-$7.43 per share, up from $6.37-$6.57. The FactSet consensus estimate was $6.66. The company said it planned to invest $2.5 billion in US capital projects and a possible expansion to its US facilities. Sales of Humira, Imbruvica, Lupron, Creon, Synagis, Kaletra, Sevoflurane and Duodopa all came in above expectations. Shares spiked $15 on the news. The company's many new drugs are going to be cash cows. Imbruvica generated $1.8 billion in sales in 2016 and could reach $7 billion annually over the next couple of years. Venclexta was approved in 2016 for leukemia and sales could peak at $3.5 billion a year. An experimental cancer drug called Rova-T could hit $5 billion a year when approved. A psoriasis drug called risankizumab could produce $4 billion a year and arthritis drug upadacitinib could peak at $3.5 billion. AbbVie's drug Humira is expected to sell more than $20 billion in 2018 after a $18 billion revenue in 2017. The FDA has 10 FDA approved indications giving it a massive patient base. This is just one of AbbVie's billion dollar blockbuster drugs. AbbVie and Amgen reached an agreement on a biosimilar for Humira. Amgen can sell its copy in the US starting Jan 23rd, 2023 and several European countries on Oct 16th, 2018. Amgen will pay royalties to AbbVie for the marketing rights. Both parties canceled legal proceedings regarding existing patents. The marketing agreement grants "non-exclusive" right, which suggests AbbVie will repeat the same agreement with other companies and thereby guaranteeing future royalty streams. AbbVie has declared war on the Gilead Sciences Hep-C franchise. The AbbVie drug Mavyret has a 97.5% cure rate and only costs $13,200 for four weeks of treatment compared to Gilead's newest drugs at $25,000 for four-weeks. Most patients are cured in 8 weeks but some have to continue for 12 weeks. Gilead's Harvoni was initially $96,000 for a 12-week treatment. 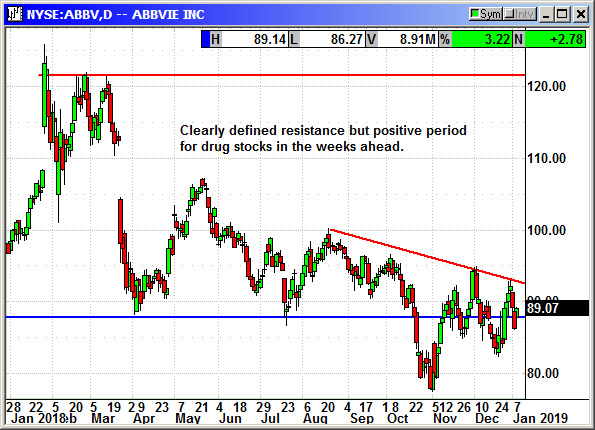 Here is the key point for AbbVie. The company said non-Humira sales are expected to rise from $9.6 billion in 2017 to $35 billion by 2025. The company is launching 20 additional products by 2020 with at least 8 of them expected to generate more than $1 billion in annual sales. These drugs will focus on Alzheimers, women's health and Hepatitis C.
Update 12/2/18: AbbVie announced a global patent license with Pfizer on Humira starting on Nov 20th, 2023. Pfizer will pay royalties to AbbVie. Pfizer can market a biosimilar in the EU when approved by the European Medicines Agency. AbbVie is getting ahead of the curve by doing these deals with other countries years in advance. This protects their current cash flow and provides royalties later. Long Jan 2020 $100 call @ $7.70, see portfolio graphic for stop loss. Dropped 12/9/18: Long Jan 2019 $120 LEAP Call @ $8.50, expiring. Long Jan 2019 $120 LEAP Call @ $3.30. Adjusted cost now $5.90. expiring -5.90 loss. No specific news. CEO Lisa Su will give a keynote speech on Wednesday at CES 2019 and that could power the stock higher. She is a rockstar in the semiconductor community. Long Jan 2020 $20 LEAP Call @ 3.57, see portfolio graphic for stop loss. No specific news. On Monday we added two contracts of the Jan 2020 $40 calls at what I hope is going to be the low for the year. Original Trade Description: Nov 11th. Apache Corporation, an independent energy company, explores for, develops, and produces natural gas, crude oil, and natural gas liquids (NGLs). The company has operations in onshore assets located Permian and Midcontinent/Gulf Coast onshore regions; and offshore assets situated in the Gulf of Mexico region. It also holds onshore assets in Egypt's Western desert; and offshore assets in the North Sea region, including the United Kingdom. As of December 31, 2017, the company had total estimated proved reserves of 1.2 billion barrel of oil equivalent, including 583 million barrels of crude oil, 204 million barrels of NGLs, and 2.3 trillion cubic feet of natural gas. Apache Corporation was founded in 1954 and is based in Houston, Texas. Company description from FinViz.com. In September 2016, Apache announced a monster discovery in Texas that could contain 75 Tcf of "rich" gas and 3 billion barrels of oil. This "was" a primarily wet gas play decades ago and companies overlooked it while they were searching for "dry" gas. The "Alpine High" play is in Reeves County of the Southern Delaware basin. Apache drilled some test wells and silently acquired nearly all the acreage in the entire play for an average cost of $1,300 per acre. This compares to prices recently paid in the Permian of $9,000 to $42,000 an acre. After Apache acquired nearly all the available acreage they drilled 19 wells to prove out the reserves. Apache said it was raising capex from $200 million to $2 billion to reflect their anticipated activity in this area. Well costs are $4-$6 million for 4,100 foot laterals. They have an estimated 3,000 drilling locations in the Woodford and Barnett formations alone. The Alpine High has 4,000 to 5,000 feet of stacked pay in up to five distinct formations including the Bone springs, Wolfcamp, Pennsylvanian, Barnett and Woodford. Apache said they also discovered oil at the Garten Prospect in the North Sea. The initial well found more than 700 feet of net pay with expectations for 10 million barrels of recoverable oil. This was the 2,500th exploration well off the UK coast. Apache owns 100% of the discovery. This is the 4th discovery in the Beryl region in the last three years and all wells will be tied back to the Beryl Alpha platform. Apache and Enterprise Product Partners (EPD) signed an agreement to accept 205,000 bpd of NGL from Apache's Alpine High play. The 658-mile EPD pipeline is expected to be completed in Q2-2019 with an initial capacity of 550,000 bpd. Apache also has the option to acquire a 33% equity stake in the pipeline once it is completed. This is a great deal for Apache and allows them to export their NGLs from the Permian while others are still backlogged. Apache partnered with investment firm Kayne Anderson to form a $3.5 billion Permian Basin pipeline firm. Apache will contribute $1 billion of assets and Kayne will contribute $900 million after a private placement offering. When the deal closes, Apache will own 71.1% of the company and it will be called Altus Midstream. There are three other companies that will participate in the private placement. Altus will operate Apache's assets in the Alpine High field and have options to buy Apache's stakes in five other planned pipeline projects from the Permian to the Gulf Coast. Apache will be able to shift about $170 in pipeline capex in Q4 to Altus and $250 million in 2019. The Altus results will be consolidated with Apache's. Apache said it was selling its 35% operating interest in the Seagull development in the North Sea and 50% of the Isabella prospect to Neptune Energy for $1 billion. Apache intends to use the proceeds to pay down debt and invest in the Alpine High project. On Halloween, Apache reported earnings of 63 cents that rose 29% and beat estimates for 43 cents. Revenues of $2.0 billion beat estimates of $1.9 billion. Apache declared a quarterly dividend of 25 cents payable Nov 21st to holders on Oct 22nd. Q3 production averages 476,255 Boepd with 64% of that was liquids, a gain of 6% from the year ago quarter. Oil and NGL production averages 305,436 bpd. Production in the Permian rose from 201,832 to 222,259 Boepd. They received an average of $69.12 per barrel for oil and 2.56 per Mcf for gas. They guided for US production to increase from 262,000 to 260,000 by the end of December. Apache is sitting on a gold mine. Black goal. The Alpine High discovery is just now accelerating into production as the initial infrastructure has been completed. As the pipelines begin operation their production is going to soar. They have been drilling like crazy and the production will catch up once the pipelines open. Oil prices are at nine-month lows and energy equities are nearly that bad. 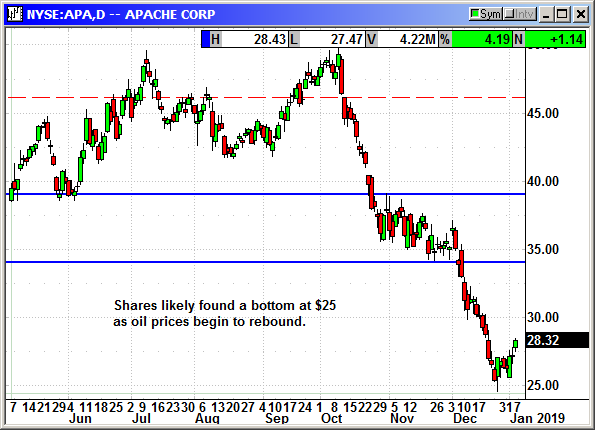 Apache has declined from $50 to $36 and has held there for the last two weeks despite the continued decline in crude. There are multiple factors that pushed oil prices lower and they are all temporary. I believe oil prices are going to rebound and lift the sector. We are able to buy APA leaps cheaply because of the crude decline. Update 11/18: Apache and Kayne Anderson Acquisition Corporation (KAAC) completed the transaction to create the Altus Midstream Company (ALTM) Permian Basin midstream pipeline company. Upon closing KAAC changed its name to Altue Midstream. Apache owns 79% of the company. Upon closing Altus entered into a credit arrangement for an $800 million unsecured five-year revolving credit facility with the ability to upsize it to $1.5 billion. The interest on this commitment is capped at LIBOR +1.425%. The new company has options to acquire stakes in five top tier Permian pipeline projects. The company currently has no debt and a substantial cash position. Update 12/9: Apache achieved first oil at the Garten development in the North Sea less than 8 months after the discovery. The initial well found 778 feet of net pay and initial production was 13,700 barrels of oil per day and 15.7 million cubic feet of gas. Apache said there is more than 10 million barrels of light oil plus gas in this discovery. Long Jan 2020 $40 LEAP Call @ $5.05, see portfolio graphic for stop loss. Long (2) Jan 2020 $40 LEAP Calls @ $1.27, see portfolio graphic for stop loss. Average cost = $2.53 with 3 contracts. Activision terminated CFO Spencer Newman and almost immediately Netflix said it had poached the CFO from Activision. That was the second time in a week the CFO changed. Earlier Square said it had hired CFO Amrita Ahuja away from Activision. The game of musical chairs is common in Silicon Valley and the stock still gained $1.81 on Friday. Original Trade Description: Dec 9th. 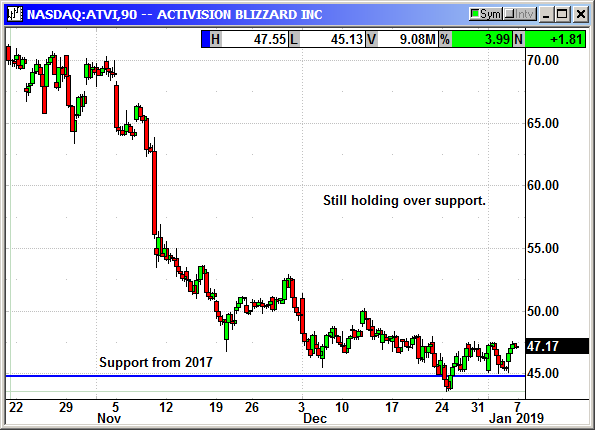 Activision Blizzard, Inc. develops and distributes content and services on video game consoles, personal computers (PC), and mobile devices. The company operates through three segments: Activision Publishing, Inc.; Blizzard Entertainment, Inc.; and King Digital Entertainment. The company develops, publishes, and sells interactive software products and entertainment content for the console and PC platforms through retail and digital channels, including subscription, full-game, and in-game sales, as well as by licensing software to third-party or related-party companies; and offers downloadable content. It also maintains a proprietary online gaming service, Battle.net that facilitates the creation of user generated content, digital distribution, and online social connectivity in its games; and develops and publishes interactive entertainment content and services primarily on mobile platforms, such as Android and iOS, as well as distributes its content and services on the PC platform primarily through Facebook. In addition, the company engages in creating original film and television content; and provides warehousing, logistics, and sales distribution services to third-party publishers of interactive entertainment software, as well as manufacturers of interactive entertainment hardware products. Its products include various genres, including first-person shooter, action/adventure, role-playing, strategy, and others. The company serves retailers and distributors, including mass-market retailers, first party digital storefronts, consumer electronics stores, discount warehouses, and game specialty stores through third-party distribution and licensing arrangements in the United States, Australia, Brazil, Canada, China, France, Germany, Ireland, Italy, Japan, Malta, Mexico, the Netherlands, Romania, Singapore, South Korea, Spain, Sweden, Taiwan, and the United Kingdom. Activision Blizzard, Inc. was incorporated in 1979 and is headquartered in Santa Monica, California. Company description from FinViz.com. Activision, like all game developers, lives and dies by the number of games launched in the quarter. If they have a couple of strong games, the earnings are great. If they have a quarter without a launch, the earnings are bad. For Q3, ATVI reported earnings of 34 cents that rose 36% from the 25 cents in the year ago quarter. Revenue of $1.51 billion declined -6.6% from $1.62 billion. The Activision segment saw revenue rise $50 million to $397 million despite the fact that Cll of Duty: Black Ops 4 did not launch until early Q4. Engagement rose slightly to 46 million MAUs in Q3. The Blizzard segment saw revenue rise 29% to $635 million with MAUs at 37 million and strong engagement in esports. The King segment saw MAUs decline from 270 million to 262 million as the Candy Crush game fades in popularity. Revenue declined 4% and income -12%. They are currently launching Candy Crush Friends Saga as a new chapter in the game. It soared to the top of the iPhone game download chart in 93 countries. The new game is on pace to drive meaningful growth of the franchise in 2019. In game bookings rose to a record $3 billion year to date. The company reiterated guidance for the full year for revenue of $7.36 billion and earnings of $2.46. Shares declined sharply because the company was not outperforming and raising their own guidance. This is simply a lack of foresight because of the game release schedule and a weak market. However, China has not approved any new games over the last nine months. China reviews games for violence, gambling, political content, sexual content as well as addictive components. China is also planning on limiting mobile games in an effort to reduce child myopia. The rapid growth in screen time on mobile devices has increased near-sightedness in children. China has been changing the way they review and approve games and there have been several start/stop methods throughout the year. The overhaul of the approval process is expected to be completed in January and a surge in approvals will occur. The bottom line is that ATVI shares crashed because of a game release schedule that was not favorable to Q3 results and the Nasdaq was already imploding at the time. Shares have found support at $47 and once the market recovers, we should see shares rise on Q4 results. I looked at adding a short term put in case the market continues lower but the cost was not worth the coverage. The worst should be over for ATVI but there is never any guarantee. Long Jan 2020 $55 call @ $6.35, see portfolio graphic for stop loss. No specific news. Closed at a 3-week high. If China news continues to improve this stock should rocket higher. Caterpillar Inc. manufactures and sells construction and mining equipment, diesel and natural gas engines, industrial gas turbines, and diesel-electric locomotives for heavy and general construction, rental, quarry, aggregate, mining, waste, material handling, oil and gas, power generation, marine, rail, and industrial markets. Its Construction Industries segment offers backhoe, compact, track-type, small and medium wheel, knuckleboom, and skid steer loaders; small and medium track-type, and site prep tractors; mini, wheel, forestry, small, medium, and large track excavators; and motorgraders, pipelayers, telehandlers, cold planers, asphalt pavers, compactors, road reclaimers, and wheel and track skidders and feller bunchers. The company's Resource Industries segment provides electric rope and hydraulic shovel, landfill and soil compactor, dragline, large wheel loader, machinery component, track and rotary drill, electronics and control system, work tool, hard rock vehicle and continuous mining system, scoop and hauler, wheel tractor scraper, large track-type tractor, and wheel dozer products; longwall, highwall, and continuous miners; and mining, off-highway, and articulated trucks. Its Energy & Transportation segment offers reciprocating engine powered generator set and engine, integrated system, turbine, centrifugal gas compressor, diesel-electric locomotive and component, and other rail-related products and services. The company's Financial Products segment offers finance for Caterpillar equipment, machinery, and engines, as well as dealers; property, casualty, life, accident, and health insurance; and insurance brokerage services, as well as purchases short-term trade receivables. Its All Other operating segments provides parts distribution and digital investments services. The company was formerly known as Caterpillar Tractor Co. and changed its name to Caterpillar Inc. in 1986. Company description from FinViz.com. CAT has been alternately ignored or talked down for the last couple years but the shares keep rising. Part of the recent gains came from the guidance. The company has been bitten by the global slowdown in construction since the financial crisis. Then it was hit by the slowdown in the energy sector. 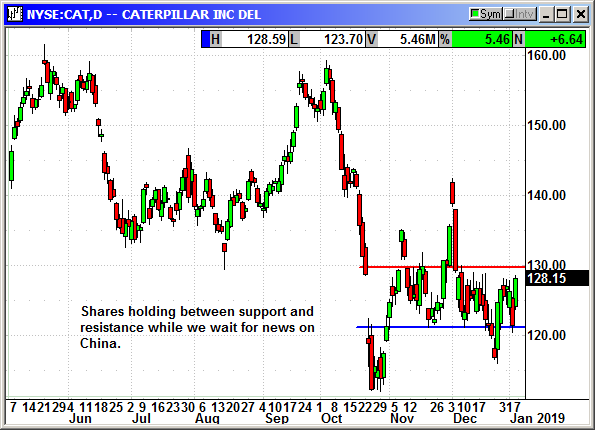 Every expected rebound falied to appear and CAT continued to give cautious guidance. That changed over the last several months. The global economy is rebounding. There are massive construction projects now underway in China and Asia. The Eurozone is also seeing a resurgence in consrtuction. Commodity metals are booming and mines are reopening shuttered capacity and opening new mines. Everything is suddenly positive for CAT. CAT said sales for Q4 rose 35% on strong global demand for construction equipment. They reported earnings of $2.16 compared to estimates for $1.79. Revenue of $12.9 billion beat estimates for $11.9 billion. The company guided for 2018 earnings of $8.25-$9.16 and analysts were expecting $8.19. The CEO said demand remains strong thanks to rising oil prices, booming construction and a rapidly rising global economy. CAT reported before the open on Thursday and shares were volatile over the last two days. However, despite the volatility shares are only down about $2 from the pre-earnings close. Given CAT's big rally over the last six months, it was no surprise to see the stock sell off sharply. 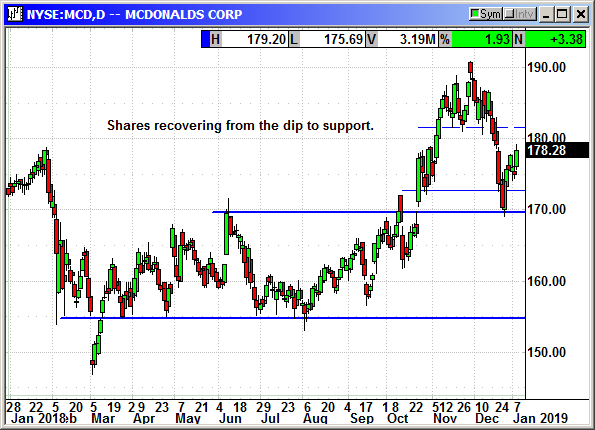 However, shares found support at $142 and the 100-day average at $144. Update 11/18: CAT said the three-month rolling sales growth for the October period rose 18%. That was still good but down from the 21% in September. Total industry sales rose 46% after a 47% rise in September and 35% in August. Energy and transportation retail sales were up 7%, with oil and gas up 20%. The report showed some slight moderation but it was still a good month despite the tariffs. Long Jun $160 call @ $6.45, see portfolio graphic for stop loss. Dropped 12/9: Long Jan $160 call @ $14.48, expiring, -14.48 loss. 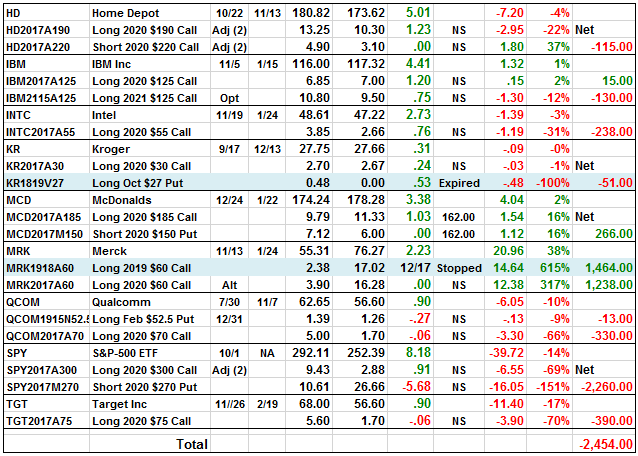 Closed 7/9: Short Jan $185 call @ $5.51, exit .68, +$4.83 gain. No specific news. These is a 2021 position. The Farm Bill passed and legalized hemp and CBD. This is a big deal for CGC because Hemp CBD could be a $22 billion industry in three years. Original Trade Description: Sept 23rd. Canopy Growth Corporation, together with its subsidiaries, engages in growing, possession, and sale of medical cannabis in Canada. Its products include dried flowers, oils and concentrates, softgel capsules, and hemps. The company offers its products under the Tweed, Black Label, Spectrum Cannabis, DNA Genetics, Leafs By Snoop, Bedrocan Canada, CraftGrow, and Foria brand names. It also offers its products through Tweed Main Street, a single online platform that enables registered patients to purchase medicinal cannabis from various producers across various brands. The company was formerly known as Tweed Marijuana Inc. and changed its name to Canopy Growth Corporation in September 2015. Canopy Growth Corporation is headquartered in Smiths Falls, Canada. Company description from FinViz.com. The cannabis sector is on fire and nobody knows how to play it because of the volatility. There will be downs as the rules are drawn and additional countries go all in on recreational use. Canada has approved recreational use starting in October for the entire country. Numerous U.S. states have passed new laws approving the use. Multiple countries have been legal for years but dozens are considering it today. Tilray (TLRY) has been getting all the news because of its wild swings on only 17.8 million shares outstanding. Tilray is actually the smallest of the big three marijuana producers. The other two are Canopy Growth (CGC) and Aurora Cannabis (ACBFF). Aurora also traded 15 million shares on Friday but they have 950 million shares outstanding. Canopy traded 11 million against 228 million outstanding. Aurora is expected to produce 570,000 kilos of weed in 2019 and Canopy is expected to produce more than 500,000 kilos. Tilray said it would only produce 76,000 kilos in 2018 and 150,000 in 2019. All three of these companies are primarily in weed today but they are rapidly moving to the CBD oils, which have a more mainstream use. Coke is looking at making drinks with CBD oil. Constellation Brands (STZ) is looking at making drinks and edibles with THC, the active ingredient in marijuana. Constellation made a $4.1 billion investment in Canopy with the option to buy more. With big money and big marketing behind Constellation and Canopy I am picking them to be the long term winner. Look how far the legalization of marijuana has come in just the last two years. Where will the business be two years from now? This is truly a "sky's the limit" potential. The tobacco companies have not yet entered the sector and the most likely entry would be the acquisition of one of these companies. There is eventually going to be a land rush as everyone interested tries to get a piece of this sector starting with the growers. If yo look at the chart is is going to scare you. The recent spike was the $4.1 billion investment by Constellation. I would not be surprised to see the stock pull back to the uptrend around $40 and if it does we will close the short call for a gain. Because of the interest in the sector, Canopy has LEAPS out in 2021. That is very long-term and should get us past all the initial volatility. Ideally, I would like to eliminate that short call at some point in the future if we see a material decline in the sector. Update 10/7: Canopy has secured supply contracts for about 35% of expected demand in Canada. Marijuana for recreational uses becomes legal on October 17th. The current US Farm Bill will legalize CBD and Canopy is one of the largest CBD producers in the world. Two additional states have marijuana legalization on the ballot in November and 8 states have already made it legal. Constellation Brands currently owns 38% of Canopy and has warrants that will allow them to take control with more than a 50% stake over the next three years. Update 10/26: Shares fell on a sell the news trade after marijuana became legal in Canada. That decline was accelerated by a bad market. 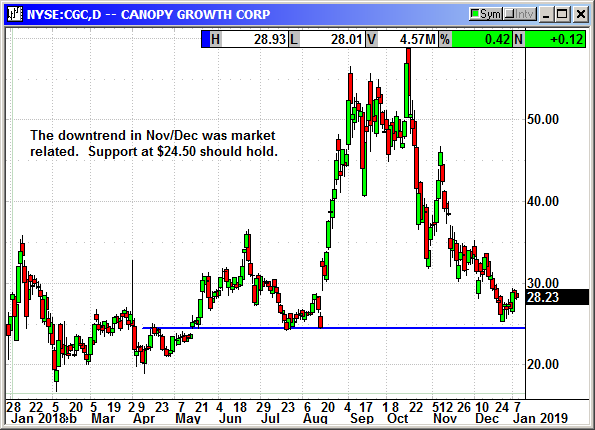 Support appeared when news from Canada said that 50-75% of inventories were sold out. In Quebec the government run stores were only open 4 days a week because they ran out of product. Some brick and mortar retail locations were expected to remain closed until further notice because of supply shortfalls by producers. One online store, Ontario Cannabis made more than 100,000 sales in the first 24 hours. Various government run stores said they were only receiving about 40% of the products they ordered. The supply shortage is likely to last. New licenses to produce marijuana are taking about 341 days to process which will then be followed by the grow time to develop mature plants ready to harvest. Update 11/18: Canopy reported a loss of $1.52 against no estimates. Revenue rose 33% to C$23.3 million and well below estimates for C$60.0 million. The biggest challenge is that Canada's legalization did not occur until the middle of October and after this reporting quarter ended. Sales of oils made up 34% of product sold, up from 18%. Kilos of cannabis harvested rose 265% to 15,127 but kilos sold rose only 9% to 2,197 because of the legalization deadline. The average price per gram rose 24% to C$9.87. The number of active registered patients in their medical program rose 34% to 84,400. It was actually a good report with the exception of the date issue. Long Jan 2021 $50 LEAP Call @ $20.30, see portfolio graphic for stop loss. Previously closed 11/26/18: Short Jan 2021 $75 LEAP Call @ $14.80, exit $7.30, +7.50 gain. JP Morgan said that the increase security surrounding Huawei and other Chinese products would be a big plus for Cisco. Multiple countries including the US are considering bans on the use of Huawei equipment for security reasons. This will benefit Cisco because they operate in the same space. Cisco is well positioned to profit from 5G and even more so if Huawei equipment is prohibited. Cisco Systems, Inc. designs, manufactures, and sells Internet Protocol (IP) based networking and other products related to the communications and information technology industry worldwide. The company offers switching products, including fixed-configuration and modular switches, and storage products that provide connectivity to end users, workstations, IP phones, wireless access points, and servers; and next-generation network routing products that interconnect public and private wireline and mobile networks for mobile, data, voice, and video applications. It also provides collaboration products comprising unified communications products, conferencing products, collaboration endpoints, and business messaging products; data center products, such as blade and rack servers, series, fabric interconnects, and management software solutions; wireless products consisting of wireless access points, WLAN controllers, cloud and appliances based services, and integrated software services. In addition, the company offers security products, including network and data center security, advanced threat protection, Web and email security, access and policy, unified threat management, and advisory, integration, and managed services; and other products, such as emerging technologies and other networking products. Further, the company offers a distributed file system for hyperconvergence that enables server-based storage systems; service provider video software and solutions; and technical support services and advanced services. It serves businesses of various sizes, public institutions, governments, and service providers. The company sells its products directly, as well as through channel partners, such as systems integrators, service providers, other resellers, and distributors. The company was founded in 1984 and is headquartered in San Jose, California. Company description from FinViz.com. It appears that everyone is moving to the subscription model for software after the success of companies like Adobe in moving from a sales to a license subscription model. Microsoft Office, Autodesk, even BlackBerry is moving to a subscription model. Cisco is moving to a subscription model on their highest capacity routers and switches. These devices cost from tens of thousands of dollar to hundreds of thousands. These are Cisco's highest capacity and smartest devices. However you need a masters in device programming to make them work correctly. With cyber security threats growing daily, enterprise users want to be able to stop the majority of the threats at the router level. Cisco now sells multiyear software as a service (SaS) subscriptions for these top of the line devices. The CEO said the unbilled revenue for SaS subscriptions was their fastest growing revenue line item even though it is not on their books. If someone signs a 3-year service contract, Cisco can only recognize the revenue from the current quarter, and then defers revenue for the rest of the fiscal year. The revenue in future years is not disclosed. Deferred and unbilled revenue was up 28% for the quarter and she said unbilled portion was the largest component. The reported earnings of 70 cents compared to estimates for 69 cents and earning only 48 cents in the year ago quarter. Revenue rose $700 million to $12.84 billion. Analysts expected $12.77 billion. For the current quarter they guided for 70-72 cents on revenue of $12.74-$12.99 billion. Analysts were expecting 69 cents and $12.58 billion. 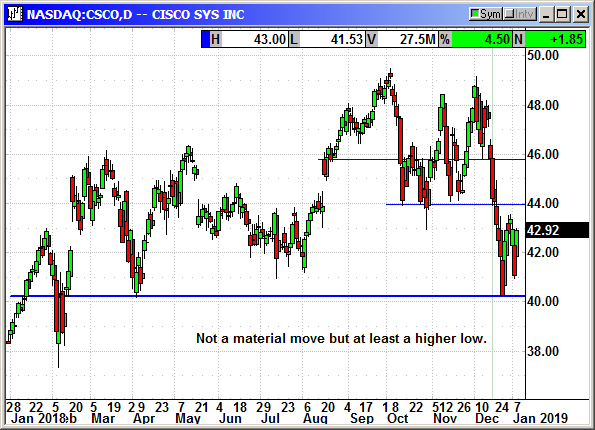 I believe Cisco is on the verge of a breakout and a long awaited move higher. Cisco has been dead money all year after a surge in Q3/Q4 last year. This consolidation period may be about over. Because of the 4.7 billion outstanding shares, the options are inexpensive and we can reach out to 2020 and capture all of the 2019 gains. Update 9/23: Cisco announced a quarterly dividend of 33 cents payable Oct 24th to holders on Oct 5th. Shares rallied into Friday's close because of the increased weighting in the reformatted XLK ETF after the removal of Google, Facebook and Netflix. Microsoft and Cisco both saw big weighting revisions. Update 11/18: Cisco reported earnings of 75 cents that beat estimates for 72 cents. Revenue of $12.14 billion missed estimates for $12.86 billion. The company guided for Q4 earnings of 71-72 cents on revenue of $12.48-$12.72 billion. Analysts were expecting 2 cents on $12.54 billion. Shares rallied on the news but fell back with the Nasdaq on Friday. Long Jan 2020 $50 Call @ $3.25, see portfolio graphic for stop loss. No specific news. Retail sales were up sharply in December and this is positive for HD. Original Trade Description: Oct 21st. The Home Depot, Inc. operates as a home improvement retailer. It operates The Home Depot stores that sell various building materials, home improvement products, lawn and garden products, and decor products, as well as provide installation, home maintenance, and professional service programs to do-it-yourself and professional customers. The company also offers installation programs that include flooring, cabinets, countertops, water heaters, and sheds; and professional installation in various categories sold through its in-home sales programs, such as roofing, siding, windows, cabinet refacing, furnaces, and central air systems, as well as acts as a contractor to provide installation services to its do-it-for-me customers through third-party installers. In addition, it provides tool and equipment rental services. The company primarily serves home owners; and professional renovators/remodelers, general contractors, handymen, property managers, building service contractors, and specialty tradesmen, such as installers. It also sells its products through online. As of January 28, 2018, the company operated 2,284 stores, including 1,980 in the United States, including the Commonwealth of Puerto Rico, and the territories of the U.S. Virgin Islands and Guam; 182 in Canada; and 122 in Mexico. The Home Depot, Inc. was founded in 1978 and is based in Atlanta, Georgia. Company description from FinViz.com. Home Depot shares have been crushed by the six consecutive months of declining home sales. The rising mortgage rates are also taking a toll. Analysts are worried the remodel boom will stall. This is simply not the case. When homeowners want to move they do buy materials from HD to fix up the house before they sell. However, when they decide they can no longer afford to sell because home prices and interest rates are too high to justify a move they still fix up their homes because they are going to stay there for a while. I cannot quantify the numbers attributable to both scenarios but they are probably not far off. We saw this in the last housing downturn when those not moving decided to remodel instead because it was cheaper. 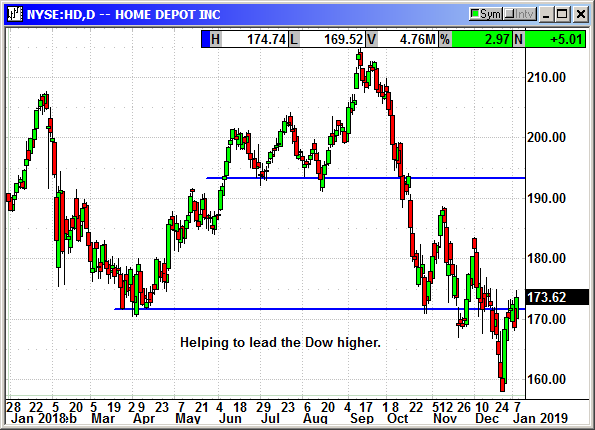 Analysts should not be worried about Home Depot earnings. The entire Southeast was hit by multiple hurricanes and that means many months of repairs that are far more costly than what homeowners would be spending just to fix up homes prior to selling. There is massive destruction and damage across multiple states and will require millions of pieces of sheetrock, shingles, siding, home appliances, 2x4s, tools, etc. Hurricane Sandy added between $300-$500 million to Home Depot revenue in the short term and we have two different hurricanes in the same area today. This will add to earnings for quarters to come. Support at $172 is solid. If I knew without a shadow of a doubt I would just say enter the position at $172. Unfortunately, nobody knows if that level will be tested again. I am going to recommend we enter now and then add to the position it we reach $172. 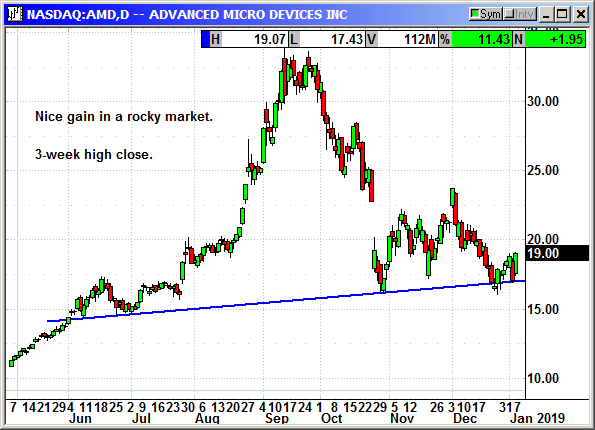 Update 10/26: HD continued to decline and closed at critical support at $172 on Friday. In the play description I said we would add to this position if HD reached $172. I do not want to blindly catch a falling knife but this is pretty strong support. Morgan Stanley reiterated an overweight position with a $200 price target. Several analysts have written that the Sears bankruptcy will benefit Home Depot and Lowe's because of the overlap in store footprints. Since Home Depot sells tools, appliances, household items, lawn and garden, etc, they will pickup any Sears customers looking for a new outlet. Update 11/18: The company reported earnings of $2.51 compared to estimates for $2.27. Revenue rose 5.1% to $26.30 billion and narrowly beat estimates for $26.242 billion. Same store sales rose 4.8% and beat estimates slightly. They guided for full year revenue to rise about 7.2% with 5.5% same store sales. They guided for earnings of $9.75. Shares will recover. Long Jan 2020 $190 LEAP Call @ $14.76, see portfolio graphic for stop loss. Short Jan 2020 $220 LEAP Call @ $5.54, see portfolio graphic for stop loss. Long Jan 2020 $190 LEAP Call @ $11.70, see portfolio graphic for stop loss. Short Jan 2020 $220 LEAP Call @ $4.27, see portfolio graphic for stop loss. No specific news. IBM CEO will present the keynote speech on Tuesday at CES 2019. Original Trade Description: Nov 4th. International Business Machines Corporation operates as an integrated technology and services company worldwide. Its Cognitive Solutions segment offers Watson, a cognitive computing platform that interacts in natural language, processes big data, and learns from interactions with people and computers. This segment also offers data and analytics solutions, including analytics and data management platforms, cloud data services, enterprise social software, talent management solutions, and solutions tailored by industry; and transaction processing software that runs mission-critical systems in banking, airlines, and retail industries. The company's Global Business Services segment offers business consulting services; delivers system integration, application management, maintenance, and support services for packaged software applications; and finance, procurement, talent and engagement, and industry-specific business process outsourcing services. Its Technology Services & Cloud Platforms segment provides cloud, project-based, outsourcing, and other managed services for enterprise IT infrastructure environments. This segment also offers technical support, and software and solution support; and integration software solutions. The company's Systems segment offers servers for businesses, cloud service providers, and scientific computing organizations; data storage products and solutions; and z/OS, an enterprise operating system. Its Global Financing segment provides lease, installment payment plans, and loan financing services; short-term working capital financing to suppliers, distributors, and resellers; and remanufacturing and remarketing services. The company was formerly known as Computing-Tabulating-Recording Co. and changed its name to International Business Machines Corporation in 1924. International Business Machines Corporation was founded in 1911 and is headquartered in Armonk, New York. Company description from FinViz.com. IBM announced last week they were acquiring Red Hat (RHT) for $34 billion. Shares were crushed and fell to $115 and a 9-year low. "They paid too much," "what were they thinking?" They were thinking about changing the playing field for cloud computing. Some analysts praised the deal saying "this is as transformative as it gets." Some analysts warned that IBM could be forced to take on billions in new debt just as interest rates were rising. IBM generates about $12 billion in free cash flow per year and Red Hat also kicks off a lot of cash. IBM alone could fund this deal using only free cash flow in three years. The IBM said the deal would be accretive in year one and would boost free cash flow and margins in year one. IBM also has $15 billion in cash on its balance sheet. IBM has been penalized for constantly falling revenue for years. The prior IBM business model was producing profits but the decline in hardware costs and move away from single clouds to multiple clouds per enterprise meant a constantly shrinking services base. To solve this problem they acquired the largest hybrid cloud provider on the planet. Not only that Red Hat dominates the open source software component of the cloud. Red Hat grows revenue each quarter at double digit rates with 85% gross margins and 20% plus operating margins. IBM has flat revenue and 50% gross margins and 20% operating margins. IBM is acquiring a revenue generating machine and they do it at high margins. More than 90% of Fortune 500 companies are Red Hat users with more than 100,000 Red Hat customers in total. The opportunity to cross sell products in the future is unbelievable. This is a marketing bonanza. In cloud alone this will boost IBMs regular cloud business. The combination of IBM and Red Hat will eventually take market share from Amazon, Google and Microsoft. With IBM shares trading at a PE of 8 this is a this is an outright bargain. It may take several months for the reality to overcome the acquisition shock but once investors realize IBM is going to be a major power player in the cloud the stock will rise and $150 could be just a pause point. Lonf Jan 2020 $125 LEAP Call @ $6.85, see portfolio graphic for stop loss. Long Jan 2021 $125 LEAP Call @ $10.80, see portfolio graphic for stop loss. IBM shares could be $200 by the time this call expires. The company was upgraded from hold to buy at BAML and the price target raised from $52 to $60. Original Trade Description: Nov 18th. Intel Corporation designs, manufactures, and sells computer, networking, data storage, and communication platforms worldwide. The company operates through Client Computing Group, Data Center Group, Internet of Things Group, Non-Volatile Memory Solutions Group, Programmable Solutions Group, and All Other segments. Its platforms are used in notebooks, desktops, and wireless and wired connectivity products; enterprise, cloud, and communication infrastructure market segments; and retail, automotive, industrial, and various other embedded applications. The company offers microprocessors, and system-on-chip and multichip packaging products. It also provides NAND flash memory products primarily used in solid-state drives; and programmable semiconductors and related products for communications, data center, industrial, military, and automotive markets. In addition, the company develops computer vision and machine learning, data analysis, localization, and mapping for advanced driver assistance systems and autonomous driving. It serves original equipment manufacturers, original design manufacturers, industrial and communication equipment manufacturers, and cloud service providers. Intel Corporation has collaboration with Tata Consultancy Services to set up a center for advanced computing that develops solutions in the areas of high performance computing, high performance data analytics, and artificial intelligence. The company was founded in 1968 and is based in Santa Clara, California. Company description from FinViz.com. Intel has bucked the trend in the chip sector by beating on earnings and giving decent guidance. 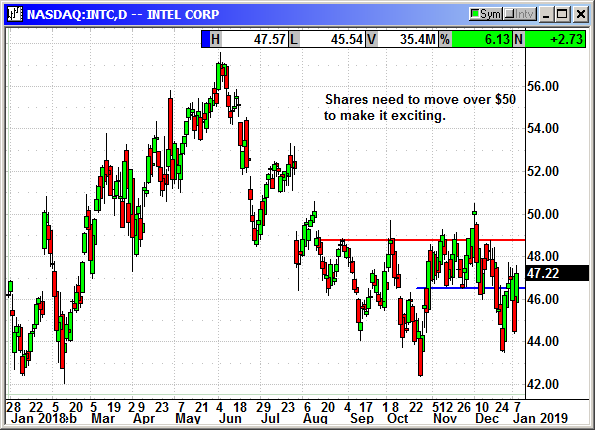 Shares have resisted any material decline in November and appear to be poised to break through resistance at $49. On Thursday Intel announced a $15 billion share buyback program. Intel had $4.7 billion remaining under a prior authorization putting them just shy of $20 billion. This represents almost 10% of the outstanding shares. Six years ago Intel had 6.5 billion shares outstanding. If they complete this buyback program they will have just over 4 billion shares outstanding. Intel is poised to profit from the coming 5G revolution. Apple has already said they are going to use Intel's 5G model in their 2020 phones. Intel has participated in more than 25 5G trials with potential partners. In the last quarter Intel said revenue from communications service providers rose 30%. The company said in August it is pursuing the $24 billion communications infrastructure segment of the market and expects to gain significant market share by 2022. Intel is not just a PC and server processor company any more. Long Jan 2020 $55 LEAP Call @ $3.85, see portfolio graphic for stop loss. No specific news. Shares traded sideways as tech stocks received all the attention on Friday. Original Trade Description: Sept 16th. The Kroger Co., together with its subsidiaries, operates as a retailer in the United States. It also manufactures and processes food products for sale in its supermarkets. The company operates supermarkets, multi-department stores, jewelry stores, and convenience stores. Its combination food and drug stores offer natural food and organic sections, pharmacies, general merchandise, pet centers, fresh seafood, and organic produce; multi-department stores provide general merchandise items, such as apparel, home fashion and furnishings, outdoor living, electronics, automotive products, toys, and fine jewelry; and price impact warehouse stores offer grocery, and health and beauty care items, as well as meat, dairy, baked goods, and fresh produce items. The company's marketplace stores comprise full-service grocery, pharmacy, health and beauty care departments, and perishable goods, as well as general merchandise, including apparel, home goods, and toys; and convenience stores comprise a limited assortment of staple food items and general merchandise, as well as sells fuel. It operates under the banner brands, such as Kroger, Ralphs, Fred Meyer, King Soopers, etc., as well as Simple Truth and Simple Truth Organic brands. As of March 8, 2018, the company operated 2,800 retail food stores under various banner names, as well as an online retail store. The Kroger Co. was founded in 1883 and is based in Cincinnati, Ohio. Company description from FinViz.com. Kroger reported Q2 earnings and beat by a penny but revenue barely missed estimates. Kroger reported earnings of 41 cents compared to estimates for 29 cents. Revenue of $27.9 billion rose 1.8% but was just below estimates for $30.0 billion. Same store sales rose 1.6% but missed estimates for 1.8%. Shares were knocked for a 12% drop. Really, were the results that bad? No. Kroger is only two quarters into their "Restock Kroger" restructuring program where they are remodeling the majority of the stores, changing the product mix and making the stores more inviting. They are spending a lot of money to prepare for the future. Here is a key point. Online sales rose 50%. How many other retailers can make that claim? They are now selling their organic Simple Truth brand in Asia through Alibaba's Tmall. They just launched Kroger Ship and expanded their Instacart offering. They guided conservatively for gull year same store sales to rise 2.0-2.5% and for earnings of $2.00-$2.15. Analysts were expecting $2.12 and that is where the stock crash was created. For a company that is remodeling 2,800 stores and spending money to improve its future results, I think this decline was overkill. Fortunately, it deflated the option prices significantly. We can buy a 2020 call for $2.57 that was in the money early last week. Kroger is not a chart ripper and it will not be $50 in January but it could be over $50 in Jan 2020 or higher as these merchandising efforts begin to bear fruit. Update 11/4: Kroger teamed up with Toys-R-Us to create Geoffrey's Toy Box at 600 Kroger locations. Kroger will offer 35 toys using the Toys-R-Us brands like Animal Zone and Imaginarium. The company's giraffe mascot, Geoffrey will be prominently displayed. Since there are a lot of kids in Kroger stores this should be a lucrative arrangement for Kroger. 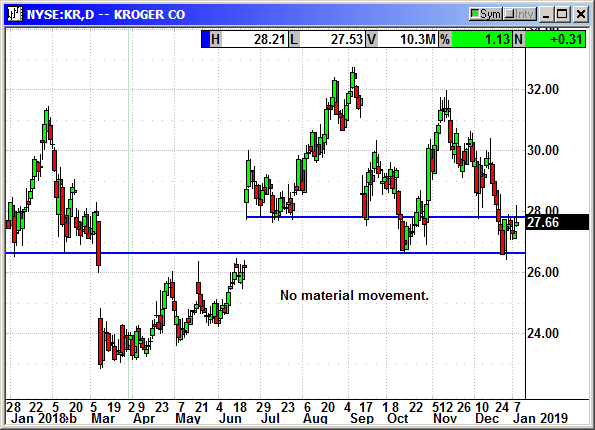 Update 12/9: Kroger reported earnings of 48 cents that beat estimates for 43 cents. Revenue of $27.67 billion narrowly beat estimates for $27.65 billion. Digital sales rose 60%. The company cut its 2018 guidance from $3.88-$4.03 to $3.80-$3.95 to reflect the additional expenses from its investment into Ocado. They reaffirmed their adjusted earnings for $2.00-$2.15. The CEO said "We are moving from a traditional grocer to a growth company with a strong customer ecosystem that offers anything, anytime, anywhere." Shares dipped with the market but rebounded sharply from support. Long Jan 2020 $30 LEAP Call @ $2.70, see portfolio graphic for stop loss. Long Oct $27 put @ 48 cents, see portfolio graphic for stop loss. 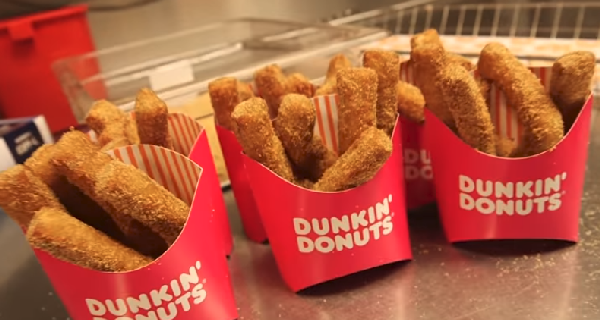 The company is reportedly ready to roll out "donut sticks" which are long pieces of donut dough deep fried and sprinkled with cinnamon sugar. Six sticks and a cup of coffee will be $1.99 or $1.29 without the coffee. This is to compete with Dunkin Donuts "donut fries." This will be a hit. Original Trade Description: December 23rd. McDonald's Corporation operates and franchises McDonald's restaurants in the United States, Europe, the Asia/Pacific, the Middle East, Africa, Canada, Latin America, and internationally. The company's restaurants offer various food products, soft drinks, coffee, and other beverages. As of December 31, 2016, it operated 36,899 restaurants, including 31,230 franchised restaurants comprising 21,559 franchised to conventional franchisees, 6,300 licensed to developmental licensees, and 3,371 licensed to foreign affiliates; and 5,669 company-operated restaurants. Company description from FinViz.com. McDonalds has revitalized their menu and now offers fresh burgers rather than frozen, all day breakfasts, inexpensive drinks, healthier sides and reasonable prices. This is not your father's McDonalds. McDonalds reported outstanding earnings with 5% revenue growth internationally and 2.4% domestically. The company said it was spending $1.6 billion to remodel 12,000 stores and add digital menu screens and ordering kiosks. Stores already updated are seeing significant upticks in ordering and average ticket size. McDonalds is currently doing 1,000 stores a month. The company reported Q3 earnings of $2.10 compared to estimates for $1.99. Revenue of $5.37 billion beat estimates for $5.30 billion. Both numbers were down from the 2017 quarter because of the downtime in each store for the remodel. Taking 1,000 stores a month offline reduces a lot of sales. Revenue in the year ago quarter was $5.75 billion. Their latest surprising innovation is food delivery. They have partnered with multiple mobile delivery services and business is booming. McDonalds said delivery orders were significantly larger than dine in or take out because people now realize they can order for parties, football games, family dinners, etc. They order multiples of everything and the average check is significantly higher than a dine in order. They are also implementing mobile ordering and payment with the order. You just show up and pick up your meal and it is ready to go. No lines to pay, no waiting for your food. They will have mobile order/pay in more than 20,000 stores by the end of 2017. The CEO said they were also seeing higher check sizes of 1.2x to 2.0x when mobile ordering is used. McDonalds said it was going to sell some of the McCafe beverages in supermarkets through a partnership with Coca Cola. The company also announced three new espresso drinks for its own stores. They are Carmel Macchiato, Cappuccino and Americano. They are going to rebrand the McCafe offerings with a new logo and packaging. They are rolling out new coffee makers to nearly all of their 14,000 stores. A consumer research company said sales at McDonalds were soaring in states that had legalized marijuana. They said 43% of users were eating at McDonalds, 18% Taco Bell, 17.8% Wendy's and 17.6% Burger King in order to satisfy their munchies after smoking pot. A side effect of marijuana is increased appetite. The company said it was speeding up installation of its self service kiosks because customers tend to visit more often and spend more money when entering their own orders. This is bad news for high school kids all across America. This will be one less opportunity for afterschool employment. McDonalds said it was removing the artificial ingredients from its burgers, chicken nuggets and will use cage free eggs by 2025. As of today about two-thirds of burgers and sandwiches have no artificial preservatives, flavors or colors. Only the pickle has an artificial preservative. Shares rose to a new 4-month high. We just closed a 2019 position for a nice gain. The decline over the last two weeks could be a new entry point. 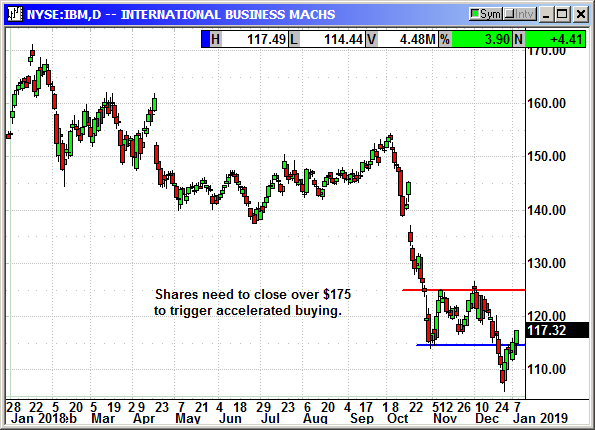 Short term support is around $174 and that is where is stopped on Friday. With the Dow down 1,600 points for the week and -414 on Friday MCD was up 47 cents. Long Jan 2020 $185 call @ $9.79, see portfolio graphic for stop loss. Short Jan 2020 $150 put @ $7.12, see portfolio graphic for stop loss. No specific news. Shares back above the long-term trend line. Merck reported earnings of $1.11 compares to the $1.03 that analysts expected. Revenue of $10.33 billion beat estimates. The company guided for full year earnings of $1,.78-$1.84 up from $1.60-$1.72. Revenue guidance rose from $39.4-$40.4 billion to $40.0-$40.5 billion. Shares were crushed after the company said it had pulled its European application for the cancer drug Keytruda. Sales of the drug nearly tripled to $1.05 billion where it has already been approved and are expected to continue to grow to $5 billion over the next two years. The reason they pulled the European application was to modify a phase III trial to focus on "overall survival" or OS rather than short-term "progression free survival" or PFS. This pushed the trial end date out to early 2019. Overall survival is the holy grail of any cancer drug. It is one thing for cancer to grow slower and let the patient live a longer life but gaining another 6-12 months of life is a fleeting goal. Living out your normal life span is the target all drugs shoot for. By modifying the trial to focus on longer term benefits, the eventual drug approval will be worth more. If the short term drug is worth $10,000 per treatment, a drug that give you upir life back is worth 10 times or even a 100 times that amount. Merck will refile the application when they have the new data but this is one drug with $3 billion a year in sales compared to their current $40 billion in overall volume. If they get the OS data they want, Keytruda could grow to $10 billion a year by 2022. I believe this drop is a buying opportunity because the LEAP premiums are miniscule for a company with a $150 billion market cap and $40 billion in annual sales. 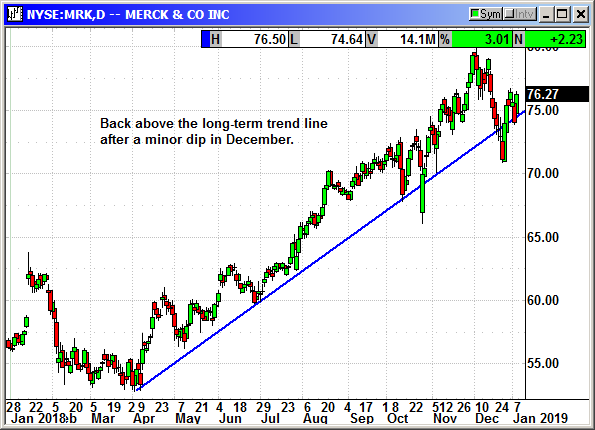 Update 10/28: Merck shares imploded after the company reported earnings of $1.19 that beat estimates for $1.14. Revenue of $10.79 billion rose 4.5% but missed estimates for $10.88 billion. They raised guidance for the full year from $4.22-$4.30 to $4.30-$4.36. Revenue guidance was narrowed but stayed in the same range. Shares fell $4 on the earnings but recovered all of it by Friday's close. The company raised its dividend 15% to 55 cents. It is payable January 8th to holders on December 17th. They also announced a $10 billion share buyback. Long Jan 2020 $60 LEAP Call @ $3.90, see portfolio graphic for stop loss. Closed 12/17: Long Jan 2019 $60 LEAP Call @ $2.38, exit $17.02, +14.64 gain. The ten-day non-jury trial against the FTC began on Thursday. This is a life or death event for Qualcomm and its license procedures. We added a Feb $52.50 put on Monday just in case the trial goes badly. We should know the expected outcome within the next two weeks as trial watchers begin reporting the proceedings. QUALCOMM Incorporated designs, develops, manufactures, and markets digital communication products worldwide. It operates through three segments: Qualcomm CDMA Technologies (QCT); Qualcomm Technology Licensing (QTL); and Qualcomm Strategic Initiatives (QSI). The QCT segment develops and supplies integrated circuits and system software based on code division multiple access (CDMA), orthogonal frequency division multiple access, and other technologies for use in wireless voice and data communications, networking, application processing, multimedia, and global positioning system products. The QTL segment grants licenses or provides rights to use portions of its intellectual property portfolio, which include various patent rights useful in the manufacture and sale of wireless products comprising products implementing CDMA2000, wideband CDMA, CDMA time division duplex, and/or long term evolution standards and their derivatives. The QSI segment invests in early-stage companies in various industries, including automotive, Internet of things, mobile, data center, and healthcare for supporting the design and introduction of new products and services for voice and data communications, and new industry segments. The company also provides products and services for mobile health; products designed for the implementation of small cells; development, and other services and related products to the United States government agencies and their contractors; and software products, and content and push-to-talk enablement services to wireless operators. In addition, it licenses chipset technology, and products and services for use in data centers. QUALCOMM Incorporated was founded in 1985 and is headquartered in San Diego, California. Company description from FinViz.com. The last 12 months have been turbulent for Qualcomm. First, they tried to acquire NXP Semiconductor (NXPI). They received approvals from 7 of the 8 countries that needed to approve the transaction. While they were waiting on China's approval, Broadcom (AVGO) made a hostile offer to acquire Qualcomm for $121 billion. Qualcomm would be forced to drop the bid for NXPI if they accepted the Broadcom bid. Qualcomm fought Broadcom and finally got the government to veto the deal under a national security rationale. Broadcom quickly made a big show of becoming a U.S. company by changing its domicile to the U.S. That was not enough to convince CFIUS they were not a threat. Eventually Broadcom dropped its bid. Qualcomm tried to continue its acquisition of NXPI but China refused to approve the acquisition and Qualcomm was forced to abandon the acquisition attempt and pay a $2 billion breakup fee. While Qualcomm and NXPI would have been stronger together, Qualcomm is not sitting still. They are rapidly moving forward on 5G communications, automotive chips, internet connectivity, Internet of Things, network processing, etc. The company just announced a $30 billion stock buyback. That is one-third of the company using the funds they had set aside for the NXPI acquisition. The next challenge for Qualcomm is settling the patent dispute with Apple. The phone company has protested the way Qualcomm collects royalties on its products. Instead of only charging a royalty on the specific parts in the phone, Qualcomm has always charged a royalty on the entire cost of the phone. In the beginning, companies did not balk because without Qualcomm's parts the phone would not have been possible. After paying royalties to Qualcomm for years, Apple decided they were paying too much money to Qualcomm and sued them to change the patent. Since Apple and every other phone manufacturer had been paying Qualcomm under this structure for years, Apple does not have a very good chance of winning. They do have a lot of money and the best lawyers in the world but the law is the law and signed agreements are tough to fight. This suit is expected to be settled later this year. Investors should be looking at Qualcomm as an outstanding investment now that the clouds have cleared. With a 4% dividend and buying back 33% of the stock, there is no reason for Qualcomm shares not to rise in the coming months. The stock should also be somewhat immune to market movement over the coming weeks thanks to the monster buyback. Update 12/16: In China a court ordered Apple to halt sales of various older iPhone models because they violated Qualcomm patents. Apple is trying to push out a software update this weekend to force phones to remove patent liabilities in China. Qualcomm is pressing the court to force an immediate halt to sales. Apple said late in the day that the China sales ban would force them to settle the patent suit with Qualcomm. Obviously, that is exactly what Qualcomm has been trying to accomplish since Apple has not paid them any royalties in two years. Apple said being forced to settle with Qualcomm would force all other manufacturers to pay higher royalties as well. Everyone has been hoping Apple would be victorious and they would benefit from the same lower royalties if Apple won. Apple is trying to claim that Qualcomm's royalty agreements, which they signed and paid royalties on for years, are no longer valid because the price of the phone has risen so high. The agreement calls for a set percentage of the sales price as the royalty amount. When phones sold for $400 it was a smaller amount but now with $1,000-$1,500 phones that same percentage is a lot larger number. Apple is also playing politics in their court filings warning that China will lose millions of dollars in taxes and revenue if the ban is enforced. They said Chinese manufacturers of competing phones would also be harmed. Of course, they could just pay Qualcomm what they owe and there would be no ban. Update 12/23: Qualcomm won another court injunction against Apple in Germany and the company will have to halt sales of iPhones in that country. The Qualcomm general council said they were also close to winning in some other countries. Update 12/30: Qualcomm faces a crisis starting on Thursday when a 10-day nonjury trial begins between them and the FTC over their patent licensing agreements. The case started about two years ago after Apple stimulated the FTC into pursuing a case by supplying the FTC with thousands of documents. Now that the case has reached trial mode, Qualcomm could see their patent structure confirmed or they could see it crushed. They receive about $6 billion a year in license fees and Apple currently owes them about $7 billion. 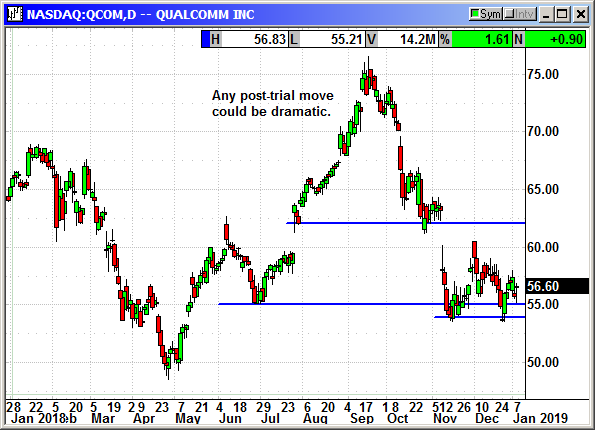 If the trial goes badly, QCOM shares could fall sharply. I am recommending we add a February put for protection. If the case goes well shares could rocket higher. Long Jan 2020 $70 call @ $5.00, see portfolio graphic for stop loss. Long Feb $52.50 put @ $1.39. 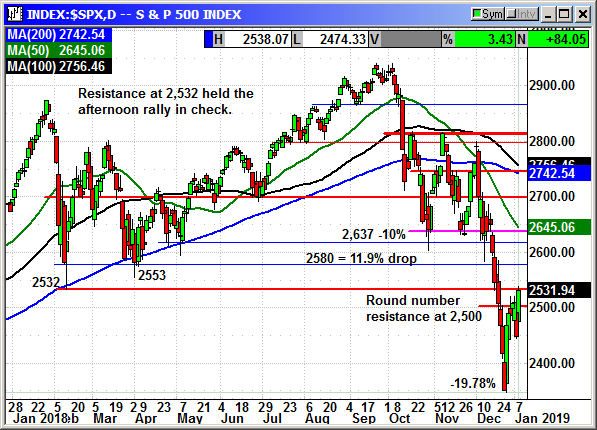 Resistance at S&P 2,500 has broken and the next battle is 2,532 then 2,580. This is a VERY long-term play on the market with a 2020 LEAP. Original Trade Description: Sept 30th. The SPDR S&P 500 trust is an exchange-traded fund which trades on the NYSE Arca under the symbol SPY. SPDR is an acronym for the Standard & Poor's Depositary Receipts, the former name of the ETF. It is designed to track the S&P 500 stock market index. This fund is the largest ETF in the world. The SPY has pulled back to the 30-day average and actually a steeper decline than the S&P-500. The SPY is near support at the 30-day average. 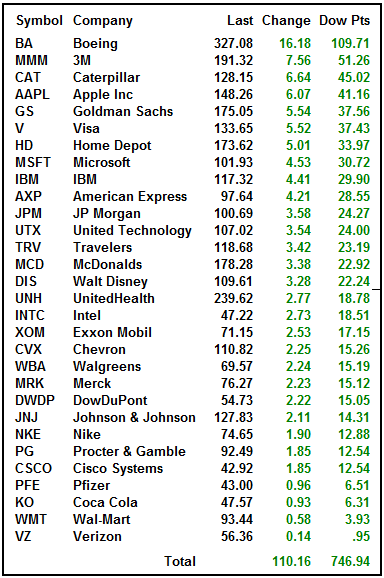 I believe the market is going to move higher during the Q3 earnings cycle. Even if we do not see a Q3 earnings rally the long-term outlook is positive. The 12 months after mid-term elections have seen the S&P gain an average of 15% for the last 18 midterms. That is 72 years and the S&P has gone up every time. There are almost no trends in the market that repeat 100% of the time. By recommending this position I have probably jinxed the coming year. However, with the economy growing at more than 4% GDP, unemployment at record lows and Q3 earnings expected to show 20% growth or better, this should be a good opportunity for the trend to repeat. If we do get a 15% rally over the next 12 months that would be 45 SPY points. The options are expensive for obvious reasons. I do not want to make it a spread and give up a significant portion of our eventual gains. I am going to recommend an offsetting short put to defray the cost of the call. If you cannot write cash secured puts then you should turn it into a spread by selling the call of your choice. Long Jan 2020 $300 Call @ $16.80, see portfolio graphic for stop loss. Short Jan 2020 $270 Put @ $10.61, see portfolio graphic for stop loss. 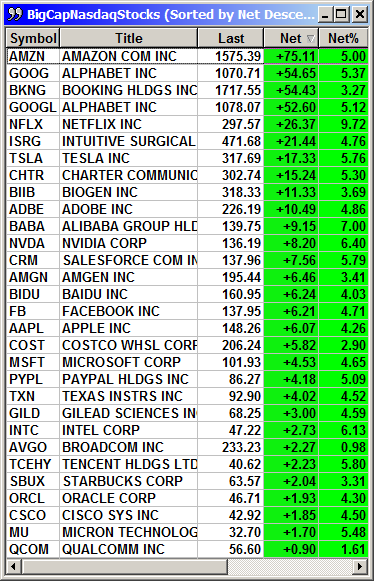 Long Jan 2020 $300 Call @ $2.05, see portfolio graphic for stop loss. Average cost of the call position = $9.43. No specific news. Shares down with the retail sector and the market in early December. Nice rebound last week. Original Trade Description: Nov 25th. Target Corporation operates as a general merchandise retailer in the United States. The company offers beauty and household essentials, including beauty products, personal and baby care products, cleaning products, paper products, and pet supplies; food and beverage products, such as dry grocery, dairy, frozen food, beverage, candy, snacks, deli, bakery, meat, and produce products; and apparel for women, men, boys, girls, toddlers, infants, and newborns, as well as intimate apparel, jewelry, accessories, and shoes. It also provides home furnishings and decor comprising furniture, lighting, kitchenware, small appliances, home decor, bed and bath products, home improvement products, and automotive products, as well as seasonal merchandise comprising patio furniture and holiday decor; and music, movies, books, computer software, sporting goods, and toys, as well as electronics that include video game hardware and software. In addition, the company offers in-store amenities, which comprise Target Cafe, Target Optical, Starbucks, and other food service offerings. It sells its products through its stores; and digital channels, including Target.com. As of March 8, 2018, the company operated 1,826 stores. Target Corporation was founded in 1902 and is headquartered in Minneapolis, Minnesota. Company description from FinViz.com. Bloody cleanup isle 5! Target shares were beaten severely when they missed estimates by 2 cents on their Q3 earnings. The company reported earnings of $1.09 that missed estimates for $1.11. Revenue rose to $17.59 billion but that missed estimates of $17.81 billion. Same store sales rose 5.1%, a 3.2% improvement but missed the 5.5% consensus. Digital sales rose a whopping 49% and now contribute 2% to overall revenue. They guided for the full year for earnings of $5.30-$5.50 and analysts were expecting $5.42. They guided for 5.0% same store sales. Analysts picked on them for a 17% rise in inventory. Target said with the demise of Toys-R-Us they had stocked up heavily on toys and planned on a big holiday. They want to grab as much of the market share from Toys-R-Us as possible and will be advertising heavily. That will draw more people into the stores and lead to more sales of other merchandise as well. They pointed out that 2018 had the maximum number of sales days on the calendar between Thanksgiving and Christmas. The guidance was the same as they issued at the end of Q2. They did not back off. The 5.0% same store sales was higher than the 4.4% the street was expecting. Target has also beefed up their more than a dozen private label brands that have a larger profit margin and that will help in the December quarter. Keybanc estimates the Toys-R-Us exit, Sears bankruptcy and other store closings has put $17 billion in retail market share up for grabs in areas where Target is expected to compete well and add multiple percentage points to their growth. Keybanc maintained their $100 price target. 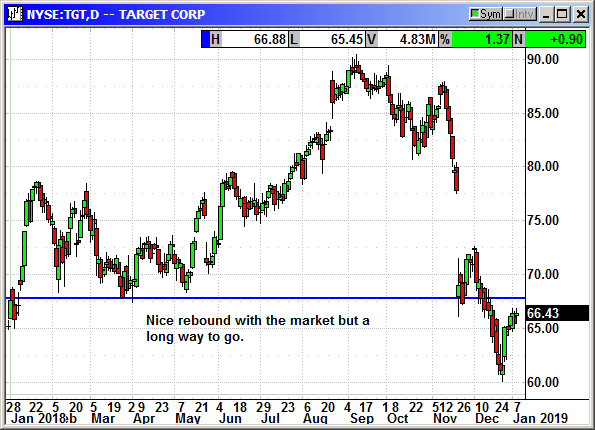 Target shares have fallen to $67 post earnings and are now trading at a PE of 13 compared to 18 for Walmart. That means Target is on sale at the right price. Update 12/16: Walmart and Target were sued by the New York Attorney General on Thursday over imported toys that contained 10 times the acceptable level of lead. The case centers on Craz-Z-Jewelz jewelry-making kits that were sold in 2016. Both companies immediately stopped selling the toys as soon as they were notified. The AG wants both companies to test toys overseas to make sure they comply with US rules. The AG is also attempting to collect civil penalties ranging from $70 to $6,000 for each kit the retailers attempted to sell in New York. Shares declined on the headline. Long Jan 2020 $75 call @ $5.60, see portfolio graphic for stop loss. If you like the trade setups you have been receiving and you are on a free trial then now is the time to subscribe. Don't wait until you miss a newsletter to decide you want to take the plunge. At Option Investor we have a long-standing policy prohibiting the editors and staff from actually trading the individual recommendations in order to conform to SEC rules concerning trades. The first week of 2019 was mostly positive except for the Apple crash on Thursday. The futures opened at +18 on Sunday night and there are no current headlines to dash expectations. This could be a good week. We have 20 current positions and that is about the most we can carry. There will not be any watch list positions until further notice. I prefer to add the normal weekly play based on conditions that week.